Everyone experiences times when they wish they could relax for a few minutes. Taking a few moments to engage in simple, everyday relaxation techniques will help to sustain and strengthen you throughout your day. 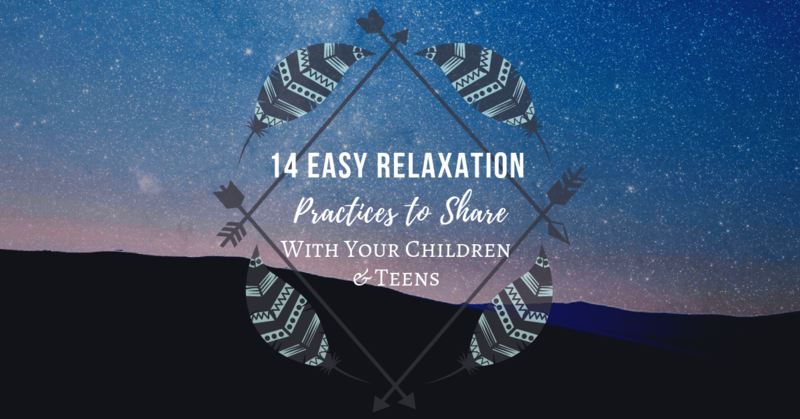 If you have relaxation practices that work for you and help your body to re-energize, you might wonder how you can encourage your children to join you. After all, their lives can be stressful as well—they’re trying to get good grades, make friends, and adapt to all of the changes that are part of growing up. Sure, it would be quite a challenge to try to train a toddler to meditate for a half hour when they can barely sit still long enough to eat. The idea is almost comical. However, there are age-appropriate relaxation activities suitable for any stage of development—from preschoolers to teens. In this article, you’ll learn how to help your children develop greater mindfulness and relieve stress. Even small children can relax and focus if you use movement and sound to make it interesting. It also helps if you can provide role modeling to your child by managing stress constructively as well. 1. Make it fun. Be sure to present relaxation practices as a helpful tool rather than punishment. Pay attention to your child’s limits so they’ll stay engaged. 2. Keep it brief. As little as one minute of seated meditation can be an achievement for a preschooler. Plan multiple activities, so you can switch things around if your child seems to be losing interest. 3. Practice deep breathing. Focusing on the breath is an excellent starting point at any age. Ask your child to imagine filling his stomach and chest with air and then releasing it like a balloon. Taking five slow deep breaths will do the trick. The proper technique is to inhale and exhale deeply through your nose and out your mouth. Let your child know that deep breathing can be done anywhere when they’re feeling stressed. 4. Play music. Does your child have some favorite songs? Take turns singing different parts or ask her to listen for specific notes. Close observation is a form of mindfulness. 5. Take a walk. You can also meditate or appreciate your surroundings while you’re moving around. Go to the park together and identify as many different kinds of flowers as you can. 6. Stretch. While at first, it may seem difficult for your child to relax while doing homework (especially if they aren’t a fan of extra school work! ), there are some techniques you can show them how to do when they’re completing assignments to help create a sense of calm. You can demonstrate to your child how to do the following stretching exercise: roll your head around, from side to side and from front to back with your eyes closed. This technique helps to relieve neck tension, increasing blood flow to the brain, which is a natural and easy way to relax. 7. Smile. Encourage your child to smile whenever possible. Smiling is proven to help relax and rejuvenate your body. Explain to your child that smiling will help to make them feel better because it releases chemicals in their bodies that make them feel good. In fact, smiling can even help to lower your heart rate and blood pressure. 8. Laugh. Laughter has been proven to be an instant stress reliever. When you can, use humor so you and your child can have fun and be energized. Tell a funny joke or story, play a fun game or sing a silly song with your kids as you’re driving. Watch humorous age-appropriate videos on YouTube together. Encouraging laughter in your home will create a peaceful environment you’ll all enjoy. 9. Talk to your child’s teacher and/or guidance counselor. Some schools are including stress management, yoga, and meditation in their curriculum. Check out what’s available and see if there’s anything you can do to help, as well as practice with your child at home. With teens, you can build on the techniques designed for younger children and introduce some new activities. As many adolescents experience anxiety and depression, meditation may be especially valuable during these years. Be sure to let your family doctor know if your teen is feeling anxious and/or depressed. 1. Increase time gradually. Keep in mind your teen’s interests and abilities. If they benefit from meditating, they may want to sit for an hour or more a day. Otherwise, you can suggest other ways to relax, such as yoga or working on hobbies they find relaxing. 2. Share experiences. Listen enthusiastically to what your teen thinks about relieving stress and living mindfully. Discuss and share your own thoughts and feelings as well. 3. Take turns teaching. Give your teen a chance to instruct you. If you do guided meditations together, you could alternate being the one to do the reading and providing directions. If you usually do tai chi, let your child know that you’d appreciate their help in coming up with new ideas for some variety. 4. Search for apps. There are several apps available for relaxation and meditation, and many of them are free. Ask for their help in finding something intriguing—they’ll love utilizing technology for inspiration. Your teen may prefer something created for their own age group, or they may be happy with a more general app geared towards everyone. 5. Sign up for classes. If you’re still looking for something more, see what’s available in your neighborhood. Check event listings at your local library and learning center to find courses on meditating or gardening. Additionally, Facebook and Meetup are great resources to find community wellness events. Whether you use a smartphone app or a simple meditation cushion, children and teens can benefit from relaxation practices. Introduce your sons and daughters to positive habits that can help them grow up to be happy and peaceful.